Strawberry-rhubarb pie I took to Jamie's cottage(s) in Maine. Determined to revive the tradition, we followed the instructions and ate it strictly for breakfast. 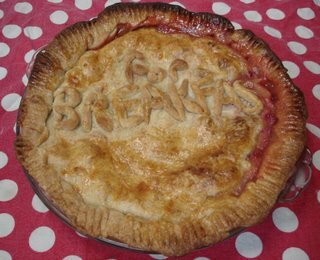 The six of us present did a reading of the text below and sang the Home Items song, "Pie For Breakfast," by Michelle Crowder. Lyrics and information to follow. “By the time Arnold’s letters were published in the mid-nineties, pie for breakfast was rapidly going out of fashion, along with almost everything else on the morning menu. Why was this? During the last decades of the last century more and more Americans went abroad, and it was these travelers who brought home the idea of the Continental breakfast, consisting of nothing but a hard, cold roll and a cup of coffee. It became fashionable to denounce pie as provincial. No one who wished to be though sophisticated dared eat a big breakfast. One must do as they did in Paris—not Paris, Maine, but Paris, France—and conform to the Continental standard, low as it was. Instead of converting the Parisians to pie, these innocents abroad permitted themselves to be seduced into surrendering their birthright. It is a conspicuous historical fact that nations are apt to copy each other’s worst features rather than their best. The anti-pie crusade was helped by the increasing tempo of American life. The curious notion that the more we rushed about the more civilized we were was beginning to take root. When we began to measure our progress by the rate of speed at which we could move and began to think that because we could get around ten or a dozen times faster than our grandfathers we were that much better than they were, pie as a morning dish was doomed. For nobody had time to eat a decent breakfast. The female figure, too, may have had something to do with it, or rather men's ideas concerning the female figure. When pie was in vogue, the buxom figure was admired. Matrons were expected to look matronly. Women could not afford to let themselves go in the matter of food, helping themselves to pie at any meal they wished without giving it a second thought. But with the gradual change in ideas of feminine beauty, women were obliged to consider the consequences of heavy eating. They began to cut down on food to reduce their figures, and breakfast, the first meal of the day, was the first to suffer. It was whittled down until it became nothing but an empty mockery of a meal."